Artifacts and skeletal remains of Cro-Magnon (modern man) did not appear in Africa until about 50000 B.C.. By 40000 B.C., there was abundant evidence of modern man in southwestern Europe and across Eurasia. Within a couple of thousand years, the Cro-Magnons obliterated the Neanderthals that had been in Eurasia for 80,000 plus years. At the end of the last Ice Age (late Pleistocene period), lowering sea levels created a land mass between Siberia and Alaska. 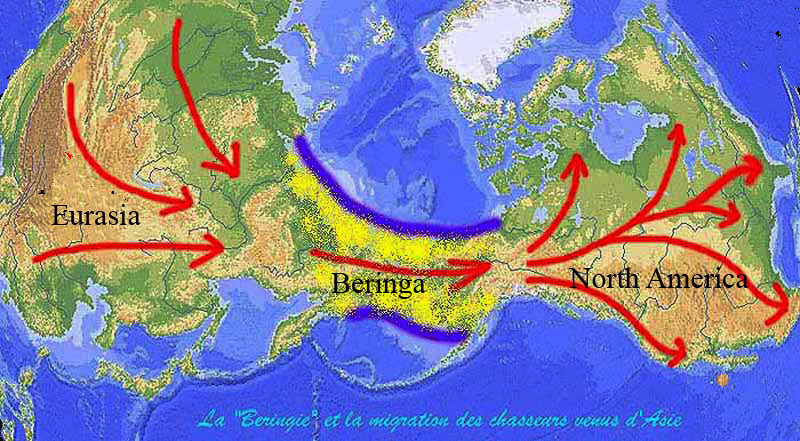 The 580,000 square mile land mass was called Beringia. 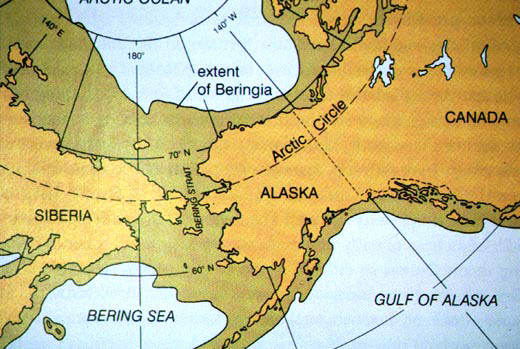 The Beringia land mass was an area about twice the size of Texas. The lowering sea levels that created Beringia provided a fifty-five mile long “land bridge” between Siberia and North America….Bering Strait. At the University of Colorado’s Institute of Arctic and Alpine Research Center, radiocarbon dating by Dr. Scott Elias has shown lowering sea levels created this land bridge about 14000 B.C. By 10500 B.C., rising sea water had submerged the Beringia land bridge beneath the Bering Strait…these studies indicate the land bridge existed about 3500 years. Based on plant life from sea-core samples, Dr. Ellis believes the area was covered with tundra plants and shrubs. His findings indicate Beringia was unsuitable for extended habitation by large grazing animals. About 13500 B.C., an ice free corridor developed in Alaska along the Yukon River. This ice free corridor allowed migrating animals and hunter-gatherers to move across Beringia and down the Yukon Valley. According to Jared Diamond, nothing moved from Alaska across the glacial ice sheets to the Great Plains south of Edmonton, Canada until the Yukon Valley was free of ice. Scientific evidence links Native American populations to Asia and eastern Siberia populations. 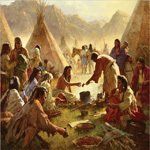 American Indians resemble some Asian populations in outward appearance, in the distribution of blood group types, and in genetic composition as reflected by molecular data, such as DNA (Cordell, Paleoamericans). 1)The Amerind (Paleo-Indians) migration, which includes most Native Americans south of the Canadian border, commenced around 11500 B.C..
2)The Na-Dene migration occurred between 10000 B.C. and 8000 B.C.. The Athabascan speaking populations of Canada and the United States belong to this group of migrants. From the Athabascan migrants, the Apache and Navajo reached the southwestern United States between 1300 and 1400 A.D..
3)The third migration around 3000 B.C. included the Aleuts and Eskimos of Alaska, Canada, and the Aleutian Islands. It should be noted the time period of migration into the Americas is a subject of heated debate among archaeologists. In his book Guns, Germs, and Steel, Jared Diamond notes if Native Americans moved southward from the Great Plains area at a rate of eight-miles per year they would reach the tip of South America within a thousand years. Based on this, the earliest arrival at the tip of South America by Paleo-Indians would be 10500 B.C.. The problem is, Monte Verde, a well-studied site in central Chile is dated at 12500 B.C. (Dillehay, Paleoamericans). If Dr. Ellis radiocarbon dating is right and the 12500 B.C. date is correct, the only way these people could have gotten there was by some type of watercraft. Archaeologist Jim Dixon believes coastal migration from Siberia to the tip of South America began as early as 14000 B.C.. There is evidence of interaction between the peoples of Americas and Europe long before Christopher Columbus discovered America, as well as, indications of direct contacts between Polynesian cultures and those in the Americas. 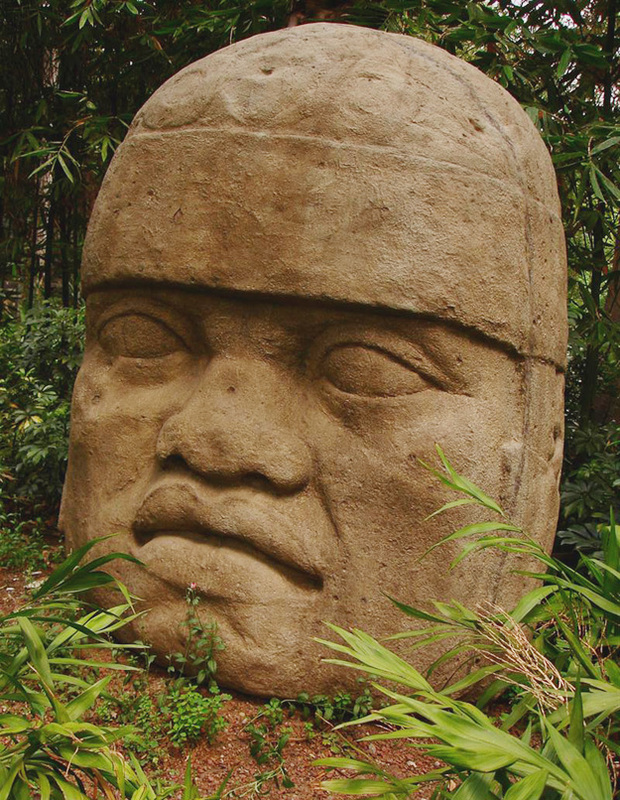 Most scholars accept the influence of Polynesian and even Asian cultures on pre-Columbian American cultures, but many are skeptical of African or European influence…based on the Olmec stone heads this is hard to understand. The Olmec of Mexico and Central America developed a political-religious center between 1200 B.C. and 400 B.C. Around this center was six colossal basalt heads. These heads measured eight to nine feet in height and weighed twenty to forty tons. The heads were carved from stone obtained 50 miles or more from the center. There seems little doubt the features of the statues are of African origin. Other findings for European influence includes Roman coins found in Venezuela. A painting of a pineapple on a wall in Pompeii;pineapples were indigenous to the Western Hemisphere. A clay head in a twelfth-century tomb in Mexico was made in third-century Rome. As with all “scientific discoveries”, the data is subject to interpretation, as is the arrival of early humans in the Americas…the date varies from 50000 B.C.to 11500 B.C..
An ice free corridor in the Yukon Valley allowed animals and Paleo-Indian hunter-gathers to migrate onto the grasslands south of Edmonton, Canada. This grassland (Great Plains or Prairie) stretched from Edmonton, Canada to the tree line in central Texas. On the west, it was bounded by the Rocky Mountains and on the east by the tree line along the Mississippi River. The Great Plains covers an area close to 500 million acres. Afraid to venture out on the prairie with its violent storms and lack of shelter, the Paleo-Indians stayed close to the east side of the Continental Divide as far south as Texas. With plenty of game in this vast area, the majority of the Paleo-Indians remained there for centuries. This does not mean all Paleo-Indians came this far south, but from the number of Paleo-Indian sites in the area, the many of them did. As several species of large herbivores become extinct, the Indians broadened their hunting areas along the edges of the prairie in search of game. In 1929, a spear point was found imbedded with the skeletal remains of mammoths near Clovis, New Mexico. Paleo-Indians occupying this site were classified as Clovis Indians. This classification was based on the lithic (stone) points associated with mammoths. Clovis points are typically relatively large with single or multiple flutes. The grooved, or fluted, area rarely extend more than a third of the way up the body. Many archaeologists believe the Clovis Indians are the first known group of people to populate the Americas. As more Paleo-Indian sites were located, archaeologists set up a stringent criteria to qualify as a Clovis site. Any site not meeting all of the Clovis criteria was not considered as being early than Clovis. Despite this “stringent criteria”, there is growing evidence of small groups of people in the Americas long before the Clovis Indians. Dating back to 11500 B.C., isolated Clovis sites have been located in North America from Alaska to Panama. It is interesting to note more Clovis points have been found east of the Mississippi than west of the Mississippi, but many of these points could have been carried there by other Indians…the only way to date a stone point is its association with an organic substance i.e. a wooly Mammoth. There are hundreds of Clovis sites in North America, but only a few sites arguably pre-date the Clovis Period. Meadowcroft Rockshelter in Washington County, Pennsylvania dates to at least 16250 B.C. and contains artifacts similar to those found in Siberia from the same time period. The fluted Clovis point has not been found at Meadowcroft or in Siberia. Other sites with early dates are: Cactus Hill in Virginia 16200 B.C., Topper in South Carolina 16000 B.C., and Monte Verde in Chile 12500 B.C.. These sites represent evidence of an early migration. Because there are so many sites dating to the period from 11500 B.C. to 10900 B.C., it is hard to imagine Clovis Indians appearing so quickly without a Pre-Clovis population in place. The age of stone “tools” found in archaeological sites is based on the level of the dig and other material at the same level i.e. charcoal…but maybe the charcoal was washed or blown into the wind-water-formed shelter from a forest fire 16,000 years ago. Living in small hunter-gatherer bands, the Clovis Indians followed primarily herds of mammoth and mastodon for about five hundred years, and then according to some archaeologists, abruptly disappeared. The Clovis disappearance coincided with the mass extinction of the Ice Age animals, such as the mastodon and wooly-haired mammoth. It has been postulated by these archaeologists over hunting by Clovis Indians contributed to this mass extinction of Ice Age animals. 1). The Pennsylvania Archaeological site states: there are hundreds of well-dated sites in both North and South America that date to between 11,500 and 10,500 years ago. 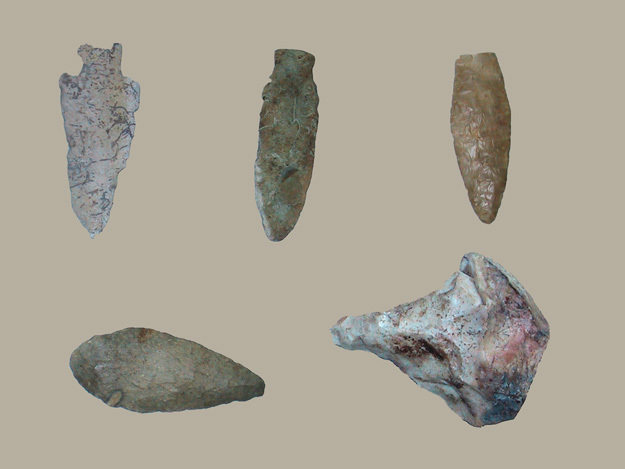 Most of these sites contain spear points with a flute, or channel along its length; in the eastern United States, these points are most often called Clovis points. 2). The North American Clovis Indians lived as hunter-gatherers in small bands of twenty to sixty extended family members on the fringe of the Great Plains, not out on it (Haines). On average, a family group consisted of eight members with two warriors. For the sake of argument, lets say several hundred sites are increased to a thousand sites by future discoveries, and ninety percent of these sites are in the southwestern United States. Using the highest figure, this put the total number of Paleo-Indians scattered across North America at approximately sixty thousand with fifty-four thousand in the southwest. Of this fifty-four thousand, twenty percent are hunters, which means there were about ten thousand hunters…the point is, no matter how the figures are juggled, there were very few Paleo-Indians, or anybody else, even on the fringes of the Great Plains between 11500 B.C. and 10500 B.C. 3) The large grass-eating animals lived on the Great Plains…Indians lived on the edge of the Great Plains. With ten thousand Paleo-Indian hunters roaming east of the Rocky Mountains between Canada and East Texas, it is a stretch of the imagination to think Paleo-Indians had much effect on the “Overkill” of anything, especially Ice Age animals…or…any people whose ancestors survived the walk from Siberia to central Texas are going to abruptly starve to death when there was plenty of other animals to hunt. Did the Clovis Indians disappear, or did they adapt a new lithic point and become classified as Folsom Indians? 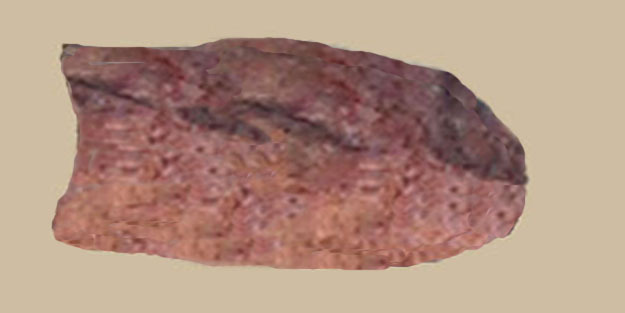 Another Paleo-Indian site found near Folsom, New Mexico had different projectile points. These supposedly new Indians were promptly named Folsom. Points from the Folsom period are found with the remains of the large plains bison rather than wooly mammoth remains from the Clovis kill sites. 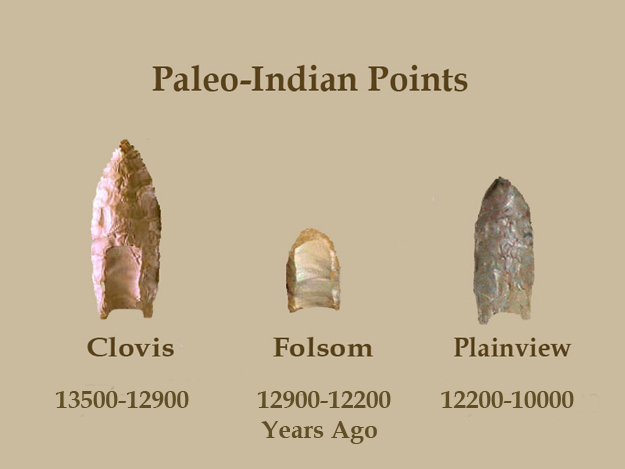 The Folsom Indians used a smaller, thinner, fluted point than the Clovis point. These small points were developed to use with the Atlatl (spear thrower). The spear point from an Atlatl could be thrown several hundred feet with great accuracy. The Atlatl remained the hunting weapon of choice for the Paleo-Indians and Archaic Indians of the southwest until the introduction of the bow and arrow around 100 A.D. The Plainview, or Plano, period followed the Folsom culture. 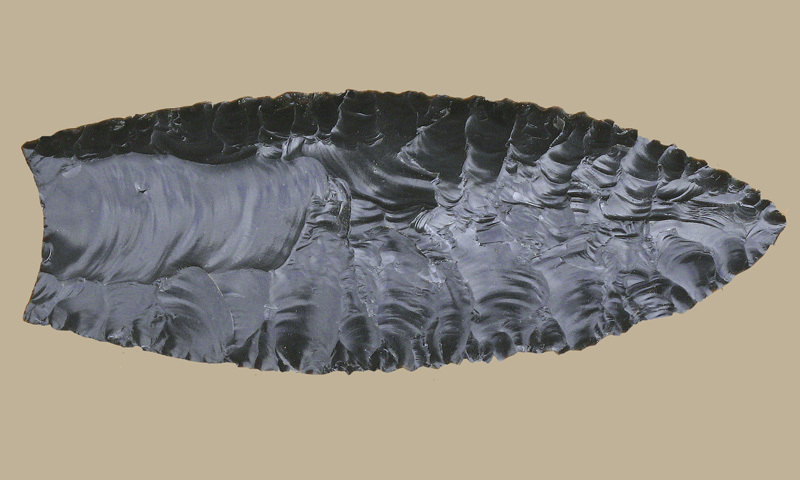 The earliest Plainview points were delicately flaked spear point without any fluting. The Paleo-Indians of the Plainview were associated primarily with the smaller woodland bison. These bison moved onto the Plains area from northern Mexico.The Plainview Indians were the first to drive animal herds off cliffs and use grinding stones to grind seeds. During the Plainview period several other types of points were found, such as, the Cumberland and Dalton 10000 B.C. – 8000 B.C..
Indians of the Archaic Period were defined on the basis of chipped stone projectile point technology and styles. During the Archaic Period the climate changed from the cold, wet weather of the Ice Age to a warmer and drier climate. Although still basically hunter-gathers, bone fish hooks and weighted nets were used to catch fish. 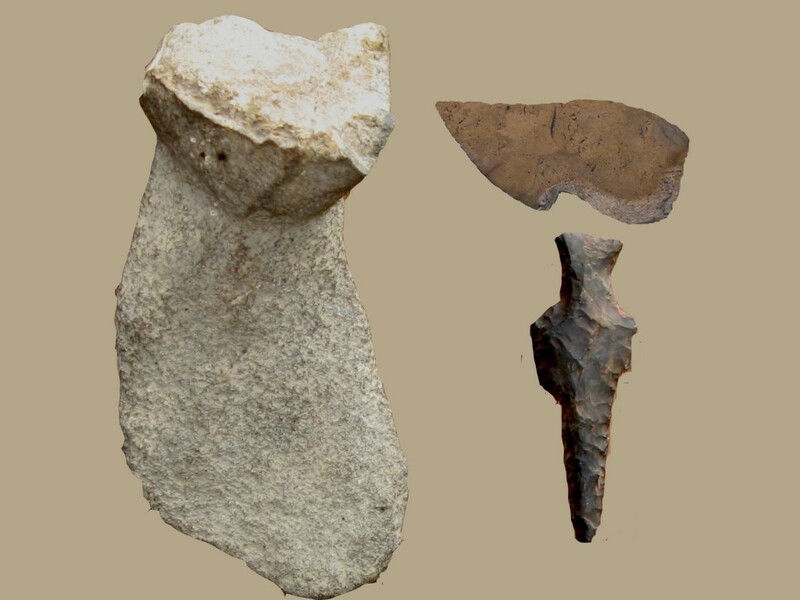 The range of stone tools included knives, drills, choppers, flake knives, scrapers, gouges, and stone hammers. 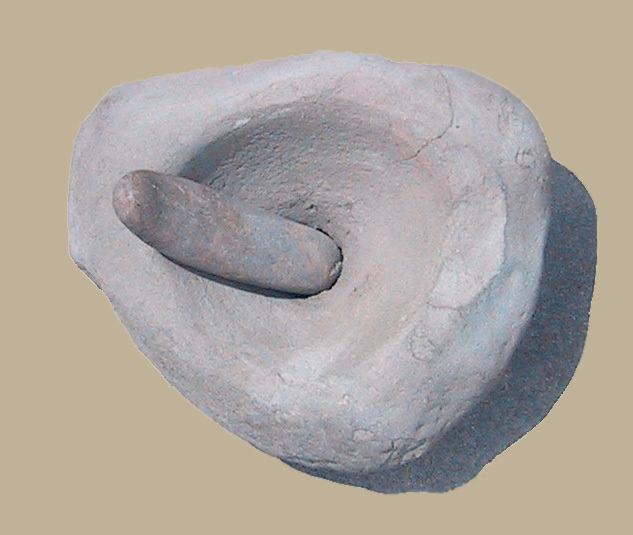 The morter was used the same as the metate except its primary use was grinding acorns. The Archaic period is further broken down in to several period. The period from 6500 B.C. to 1200 B.C. is referred to as the Desert Archaic. The Barrier Canyon Indians emerged out of this period. The Desert Archaic Indians were basically hunter-gatherers with more reliance on gathering seeds, berries, and nuts. The “Southwest Indian” cultures developed out of the late Desert Archaic period which is considered from 1200 B.C. to 100 A.D. The Hohokam, Mogollon, and Anasazi cultures emerged out of this period. Native Americans hunted, fished, planted crops, and created elaborate stone tools during this period which is sometimes referred to as late Desert Archaic. Ground was cleared to plant “the three sisters”…corn, beans, and squash acquired from Meso-America. Relying more on agriculture made it possible to stay in more permanent villages. This led to the develop of pottery and the establishment of trade networks between the various groups of Native Americans including those in Mesoamerica. The Mississippian Indians were scattered over a wide area along the Mississippi River and its drainages. 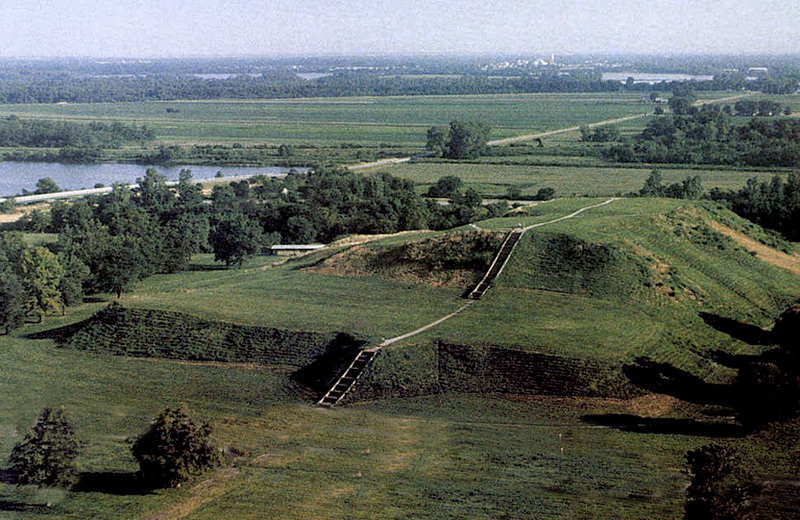 Across the Mississippi River from St. Louis, Cahokia contained one hundred and twenty flat-topped mounds. At its peak population, Cahokia was the largest city north of Mesoamerica with a population larger than London. Archaeological evidence suggests Cahokia was a political and religious center as well as place of commerce and trade. Mound Builders raised maize (corn) and conducted a wide trade network in copper and marine shell. Archaeologist estimate thousands of workers used woven baskets to move an estimated 55 million cubic feet of earth to create the Cahokia mounds and community plazas. B.C.E. (before the common era). B.C. and B.C.E. are the same – B.C.E for politically correct archaeologists. C.E. is equivalent to A.D.
B.P. (Before Present) is used in age determination instead of B.C. or B.C.E. – “Before Present” is academically defined as the year 1950, which is the year B.P. was first used. R.C.B.P. – Radiocarbon dates or ages, which are constantly changed because of inaccuracy in the technique. R.C.B.P. (un-cal) same as R.C.B.P. R.C.B.P. (calibrated) – calibrated to calendar years. If these adjustment for political correctness are not bad enough, the term years ago frequently follows the date. Does this mean from today, from 1950, or even 2,011 years ago??? Radiocarbon dating is based on a lot of assumption about the half-life of Carbon 14 in relation to the stable Carbon 12 , such as atmosphere, type of soil, weather, etc,. These factors produce a relatively wide margin of error in Carbon 14 dating. Another limitation to Carbon 14 dating is it applies only to organic material such as bone, flesh, or wood. Radiocarbon dating can’t be used to date rocks i.e. Indian points, petroglyph, or pictographs. For a candid discussion of archaeologists read the Waldo Wilcox comments on the Range Creek Fremont study in the August 2006 National Geographic and Denver Post. The settling of North and South America by prehistoric people leaves many questions unanswered. One thing known for certain is the Americas were populated by people…some by land, some by boat…how, when, or why is primarily speculation with no consensus among the various schools of Archaeology. The Paleo Indian article was written by Ned Eddins of Afton, Wyoming. To return to the Indian home page click on the Indian logo. Jacobs, James Q – These are excellent sites.